Nia Franklin has won the Miss America 2019 crown! Franklin, who represented New York, swept the crown during the 92nd annual competition on Sunday, September 9. Ross Mathews and Carrie Ann Inaba were the hosts of the event aired live from Boardwalk Hall in Atlantic City. Miss Connecticut Bridget Oei took runner-up while Miss Louisiana Holli’ Conway took third place. 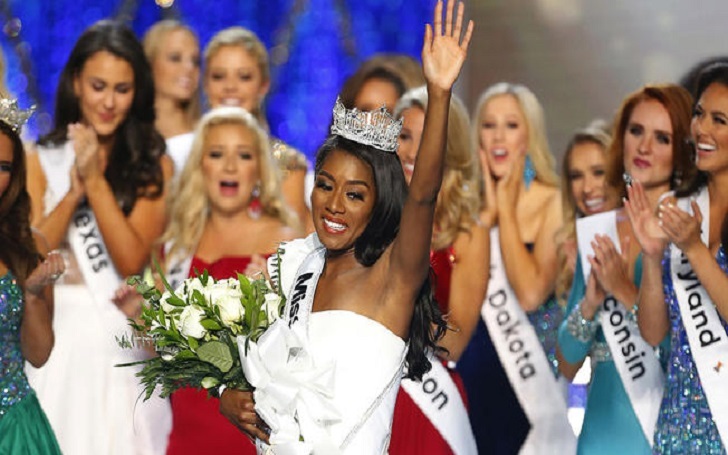 Miss America 2019's judges were former pro boxer Laila Ali, Wilson Phillips singer Carnie Wilson, former American Idol judge Randy Jackson, songstress Jessie James Decker, HBO personality Soledad O’Brien, Drybar founder Alli Webb and radio host Bobby Bones. This year's competition was certainly different from the past years. The swimsuit portion of the night was canceled out in the wake of the #MeToo movement. This led the contestants to be judged on the basis of their interviews and what the ladies stand for, rather than how they look. The newly minted chair of the Miss America Organization’s Board of Trustees, Gretchen Carlson, who is also a Former Miss America, announced the change in June. We are no longer a pageant. We are a competition. We will no longer judge our candidates on their outward physical appearance. That’s huge! And that means that we will no longer have a swimsuit competition. That was not the only change to the competition; Gretchen also explained that the women would now be allowed to choose the evening gown portion for their form of attire, including pantsuits. She explained, "We are no longer judging women when they come out in their chosen attire. It’s going to be what comes out of their mouth that we’re interested in when they talk about their social impact initiatives."